StonePly is committed to producing the finest quality. As the world leader in natural stone/honeycomb composite panels, StonePly observes rigorous quality control procedures and testing. Owners and specifiers receive the peace of mind that comes from knowing StonePly has been subjected to testing well beyond the code minimum. Testing is performed at both independent national laboratories and universities as well as StonePly's own research and manufacturing facilities. ASTM E330 Tested to pressures in excess of 180 psf. (245 mph wind) No delamination or disengagement. ASCE 7-98 results vary based on height, location, etc. ASTM B117 300 hours. No deleterious effects. ASTM C67 Passed. 100 cycles. No checking, delaminating, cracking or splitting. ASTM D2247 Passed. No deleterious effects after 120-day exposure. ASTM D3273 Passes. Tested with both granite and marble. ASTM E331 Passed. No water penetration to the innermost plane of the wall. ASTM G53 2000 hours. No deterioration. 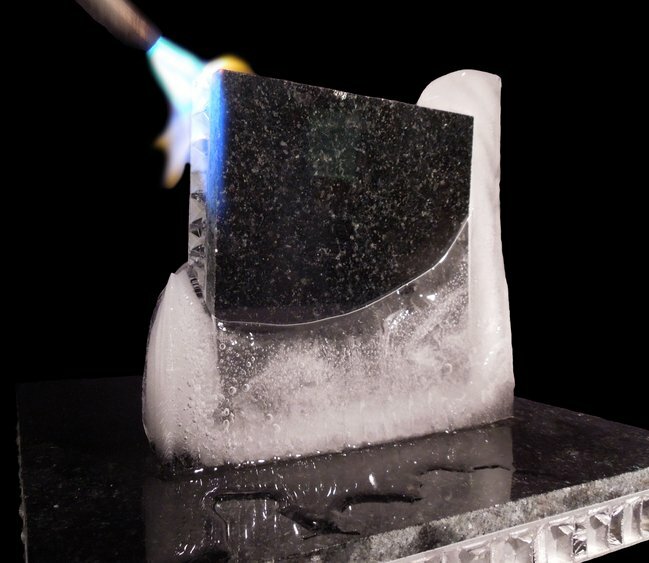 Panels soaked in water @ 20 °C for 4 days, then placed at -10 °C for 2 hours and +20 °C for 2 hours. 100 cycles. No delamination or failure. ASTM E 330-02 Standard Test Method for Structural Performance of Exterior Windows, Doors, Skylights and Curtain Walls by Uniform Static Air Pressure Difference. After three years of exposure to two different climates, three panels were tested under uniform static air pressure at 70 psf (approx. 165mph wind) and 105 psf to test structural performance. No attachment or panel failure. ASTM E 330-00 Standard Test Method for Structural Performance of Exterior Windows, Doors, Skylights and Curtain Walls by Uniform Static Air Pressure Difference. Static Pressure tests were performed to determine if it met the performance requirements for a category 5 hurricane force winds. The panel was tested at 160 psf. All the panels tested met or exceeded requirements. 100 cycles of freeze + heat. -10 to 170 degrees F while partially submerged in a 4ph sulphurous acid solution. Less than 11% reduction in flexural strength. No significant difference in load deflection of exposed vs. not exposed specimens. 24" X 34" Panel center loaded with 1,600lbs. Supports placed at 34" Deflection was less than .032"
Span in inches 48" 36" 30" 24"
Modified ASTM E 119 System remained in place during a 30-minute fire exposure test. Conducted per modified ASTM E119 "Standard Methods of Fire Endurance Tests of Building Construction and Materials." ASTM E119 Fire resistance rating of one-hour and two-hour wall assemblies was not reduced by the addition of the StonePly. Read more about fire rating and testing.